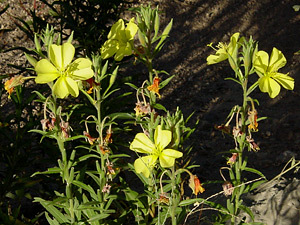 Habitat: Desert (upper elevations), Upland, Mountain, Riparian. This plant typically grows in moist locations and is usually found in riparian areas here. Flowering Season: Summer, Fall. This showy wildflower blooms after the summer monsoon rains have begun. 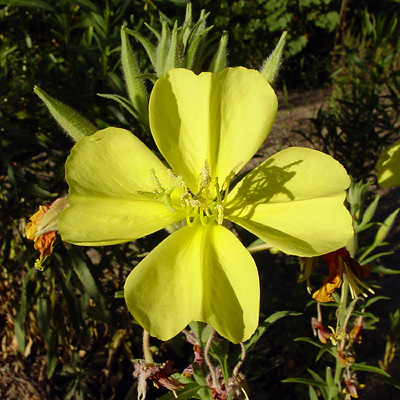 Description: The flowers open late in the day and then close the following morning. The flowers are up to 3 inches (7.6 cm) across and have 4 broadly heart-shaped, yellow petals that turn a reddish orange color as they age and wilt. The flowers are followed by slender, green, 2 inch (5 cm) long seedpods. The leaves grow along the stems and are green and lanceolate or elliptical in shape. The stems are slender and upright, and the plants are tall and narrow. Butterfly Plant – The flowers attract hummingbird moths. Edible – The raw or cooked young leaves, cooked young seedpods, and the boiled roots are edible but have a mucilaginous texture. Fragrant – The flowers are nocturnal and fragrant at night.